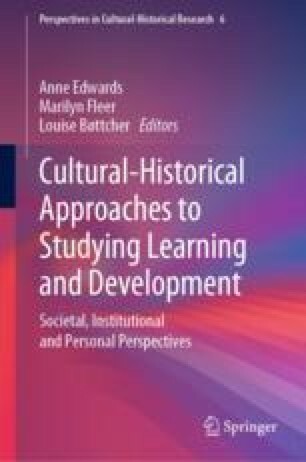 Focusing on the nature of culturally responsive pedagogic action, this chapter takes a dialectical interactive approach to understanding children’s learning and development and is broadly framed by Hedegaard’s attention to planes of analysis and the relevance of demands in institutional practices within that framing. Based in a dataset generated over 6 months in a Digantar school and its community in rural Rajasthan, the study used Edwards’ conceptualisation of ‘common knowledge’ and the Vygotskian concept of ‘social situation of development’ to understand how teachers aligned their pedagogic motives with those of their pupils, while negotiating the object of activity in lessons. The analysis of classroom data revealed how the teachers built common knowledge in and outside the classroom. This common knowledge connected: (i) knowledge of content of one’s own mind, i.e. the subjectivities of the teachers and the children; (ii) knowledge of the content of others’ minds, i.e. teachers’ pedagogic engagements with children, parents and other teachers; and (iii) knowledge of the shared environment and publicly validated knowledge. The chapter then discusses how this common knowledge was used as a pedagogic resource by the teachers in their work with pupils, as they enabled children’s constructions of their social situations of development.